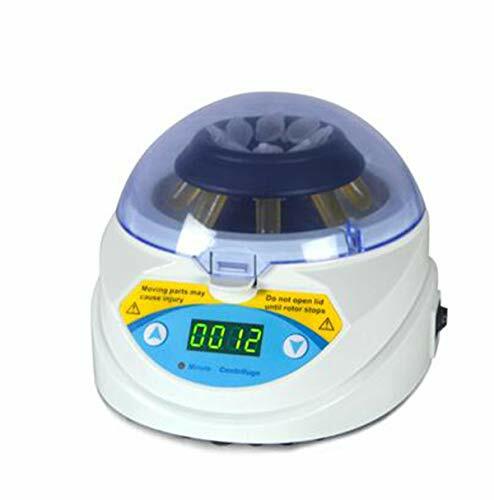 The mini centrifuge series MINI-10K is perfect designed with novel and unique appearance. It is pretty and skillful, equipped with 2 types of rotors and several tube carriers for 2.0ml / 1.5ml / 0.5ml / 0.2ml tubes and 0.2ml x 8 PCR tube rank. It is designed for feeling. Open/close the cover will automatically start/stop the centrifuge. Built-in timing function. Humanism is fully displayed in its transparent roundness cover, several rotors, and tube carriers for choice. 1. Large radius rotor with 8 tube holes, centrifugal force is 1.5 times bigger than ordinary 6-hole rotor at the same rolling speed. 2. The cover switch is outward designed and superstructure automatically bounce 95 degrees which is convenient for one-hand operation. 3. The rotor is clip-on fixed. It is very convenient for rotors exchanging and pick-and-place. 4. LED display the rolling speed and timing. 5. Practice silent and stable. free-maintenance motor, long life and safe. 6. Delicate appearance. Multi-purpose to meet different experiments demands. View More In Centrifugal Filters. eCon Lab Supply Centrifugal Filters .22µm RC, 23mL , 50/pkg. eCon Lab Supply Centrifugal Filters .22µm PTFE, 23mL , 50/pkg. eCon Lab Supply Centrifugal Filters .22µm PP, 23mL , 50/pkg. eCon Lab Supply Centrifugal Filters .22µm CA, 23mL , 50/pkg. eCon Lab Supply Centrifugal Filters .22µm NC, 23mL , 50/pkg. eCon Lab Supply Centrifugal Filters .45µm Nylon, 23mL , 50/pkg. eCon Lab Supply Centrifugal Filters .45µm PES, 23mL , 50/pkg. eCon Lab Supply Centrifugal Filters .45µm PVDF, 23mL , 50/pkg.